1) This is a peer reviewed paper that has been prepared and presented at the FIG Working Week in Eilat, Israel, 3-8 May 2009. This paper has received a grant from the FIG Foundation to allow the author to attend the conference and present his paper. Key words: cadastre system, security of ownership/right, notary public, land administration, land management. This paper attempts to briefly present the Cadastral System in Eritrea with focus on practice, constraints and prospects. The paper describes mainly the Eritrean cadastre, but land registry is also noted when ever deemed appropriate. The office for the registration of land and other immovable property was established during the Italian colonial period with the main purpose of guaranteeing security of ownership. The purpose of the cadastral system, unlike that of Western Europe that aimed at taxation was established for guaranteeing security of ownership for the Italian settlers in Eritrea. The Cadastre Office existed for more than a century, but without any change of procedures. The registration system remained voluntary having neither national nor definite geographical coverage. The main focus remained on urban and some rural commercial areas. The Cadastre Office and that of the Notary Public worked in close collaboration, but experienced difficult periods and attempts at their elimination during the Ethiopian colonial rule. However, they survived as institutions. Land as resource to be managed properly needs accurate information. In the post independence years, Land and Registration Laws were proclaimed to facilitate the pace of development. However, due to the so called ‘Border War’ with Ethiopia and the prevailing conditions of ‘no war, no peace’, the main part of the proclamation, providing usufruct land rights to rural people, largely remains un-implemented. Besides, unlike in many other countries land administration and their core cadastral components that are essential infrastructure facilitating implementation of land policies are in- adequately coordinated. Moreover, although compulsory, the cadastral system still operates largely on voluntary basis due to low institutional infrastructure, and records are also manually kept making data integration difficult. The office made feasibility study, and based on this, it has set its priorities, medium and long term objectives and strategies. The cadastral system has not gone far beyond urban areas. The benefits of cadastral system in Eritrea’s reality have also been elaborated. The need for control, standardization, and coordination is great. Overall, there is low institutional infrastructural capacity. Finally, attempts have been made to learn from comparative practices from the European experience, and have opted for a pragmatic approach of cadastral system, a ‘progressive cadastre’ that goes step by step to a cadastre having a comprehensive coverage and automation. It is not a choice to be made but a must to be done by a country to properly manage its land and resources and fit with the global economy competitively. The office for the registration of land and other immovable property erected over land, the Cadastral Office, was first established in Eritrea during the Italian colonial period in 1888. Although the Italian Cadastre/ land registry systems were influenced by Napoleonic Cadastre, which was adopted by many European countries for the purpose of taxation, the objective of its cadastral system in Eritrea was to secure ownership of property of Italian settlers. However, the Italian cadastral system, like that of Spain remained predominantly fiscal cadastre, partially developed and the link between the two was weak. Unlike the Italian one, the cadastre and land registry systems of Germany, Austria, the Netherlands and Switzerland are closely linked (Larsson, 1996, pp. 30- 34). 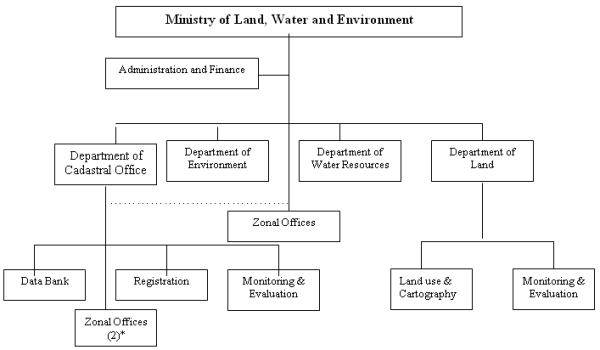 The Eritrean cadastre and land registry was integrated in one office. Cadastre, as a parcel- based land information system for social and economic development developed in many European countries from the need to tax land equitably (Osterberg, 1994, pp. 2- 4) whereas in Eritrea it was developed to guarantee security of property ownership of Italian Settlers, since one of the main goals of Italian colonialism was to make Eritrea a settler colony. It was based on administrative division of land into parcels, having maps and records. To fulfill its mandate it was organized autonomously under the Judiciary. The registration system was manually carried out on voluntary basis and confined mainly to urban areas and some parts of the country where land was allocated to Italian settlers for commercial agriculture. A cadastre or land register system must cover a definite area or whole country to provide the necessary benefits, and the European experiences show that voluntary or sporadic registration is insufficient for establishing comprehensive land records (Larsson, 1996, p. 39). The Notary Public came into existence with the establishment of cadastral system. At the beginning, Governors were mandated to choose the Notary Public. However, from 1935, it was reinforced according to Italian Proclamation No. 1649 and continued until 1956, when a revised law was introduced. According to this law, the number of public notaries to be licensed, the criteria for competence, withdrawal of license etc. was mandated to the Judiciary. The Notary Public and the Cadastral Office worked in close collaboration in the registration of property transactions. However, during the Ethiopian colonial rule, especially the Derg (Higher Military Committee), the Notary Public survived attempts of elimination as an institution and continued as an independent body up-to the end of 1995 (Weldegiorgis, 2007, pp. 1-2). After this period, it has been restructured only under one zonal administration, that of Zoba (Region) Maekel, while in the other five regions it is yet to be re-organized. A ‘Notary Public is an officer authorized by state law to certify documents and to take oaths’ (World Book Encyclopedia, 1994). Many documents need to be notarized before they become legally effective. The Eritrean Notary Public plays the role of an agent for the authenticity of contract agreement in the transfer of immovable property, prepares all the paper work of agreement, authenticates title- deeds and sends them to the Cadastral Office for official title registration, which is a certificate of ownership. The deed is a record of contract of a particular transaction – purchase, inheritance, donation, etc. - that serves as specific agreement. It is similar to other countries’ ‘real estate agent’, like that of Sweden which facilitates the sale of property (Swedessurvey, 1998). But unlike in other countries, the Eritrean Notary Public prepares most of the paper work related to contract of the vendor and buyer. The office registered buildings that had physical plan and habitation license for the main urban centers as well as properly surveyed for land sporadically allocated mainly to settlers for commercial agriculture. In this way the office has continued for over a century, but without any qualitative change in its procedures. During the Ethiopian colonial rule, particularly the ‘Derg’ all houses considered extra were nationalized. Besides as thousands of Eritrean nationals joined the armed struggle for liberation or fled to other countries, their property, particularly the unregistered ones, and in the squatter areas changed ownership through either close relatives to save the property from nationalization or through selfish individuals by bringing so-called witnesses to the ‘kebelie’ (Administration) and being approved by ‘Frdi Shengo’ (Community Court). It was indeed a paradox where legal owners lost protection of property. All these painful and illegal practices endangered the main purpose of the cadastre: guaranteeing security of property ownership. Because of nationalization, the construction industry came almost to standstill during this period. During this time the office of the Cadastre and that of the Notary Public narrowly escaped attempts of elimination as all extra-houses, small and large, were nationalized and the need for registration of private houses was considered as a bourgeois practice. After independence the Cadastre Office continued functioning and despite some shortcomings, it was the main supporter and reliable source of evidence providing property security in the Housing Commission’s process of verification of property ownership. The Commission for the Verification of Houses was established in early 1992 to verify and ascertain ownership and to return the nationalized houses and property that had lost their legal owner to their rightful original owners. The nationalized houses, particularly those of Italian settlers in Eritrea had already been compensated in early 1980s, by the Italian government according to agreement signed between the Ethiopian and Italian governments. As stated above, the registration system was partial and incomprehensive, however, maintained property records with utmost care and its contribution to the new registration system is of paramount importance: having a tradition of registration in itself is an advantage. In 1994, the state of Eritrea stated its land policy in its Macro- Policy. The land policy was followed by Proclamation NO. 58/1994 - A proclamation to reform the System of Land Tenure in Eritrea, to determine the Manner of Expropriating Land for Purposes of Development and National Reconstruction, and to determine the Powers and Duties of the Land Commission. However, the introduction of an efficient, simple and modern system for the registration of land and buildings was imperative for an effective implementation of Land law, and expediting national economic development. Hence, Proclamation NO. 95/1997 - A Proclamation to Provide for the Registration of Land and Other Immovable Property was issued. It repealed and replaced all previous laws, proclamations, provisions, regulations and directives that have hitherto been applicable to the registration of land and other immovable property. The Proclamation made ‘title registration’, like in many countries compulsory. At present, the Cadastre Office is under the Ministry of Land, Water and Environment (MLWE). By the end of August 1999, it was restructured as a Division in the Department of Land, of the MLWE. Previously it was under the Ministry of Justice. As land, water and environment are strategically important resources of the country, the three complementary departments, Land, Water and Environment merged into the MLWE, which was established in March 1997 during the second government restructuring process. The MLWE (see Fig. 1) is a regulatory body responsible for the management of land, water and environment of the country at policy level. The cadastre system is a tool for proper management of land and its resources and hence the Cadastre Office, which was upgraded to a department during the third quarter of 2003, became a fourth Department. The Zonal Offices of the Ministry, with the status of division coordinate the units of the Departments and undertake operational work under the Zonal Administration. The Land Unit within the Division, for example, is responsible for land allocation, land lease contract/certificate, etc. Unlike the other departments, the Cadastre Office has only two Zonal Offices: the offices for Zoba Semienawi Keih Bahri (Northern Red Sea Region) and Zoba Debub (Southern Region), which were established respectively by the end of the first quarter of 2006 and second quarter of 2007. These offices although coordinated by the division of the Ministry receive work guidance directly from the main Cadastral Office. The cadastre and land register systems in Western Europe are closely linked. However, the French cadastre system as a pioneer has not progressed far in the link of the two relative to other countries, and its influence is also seen in its former colonies in North and West Africa where cadastre and land register cover only a portion of land (Larsson, 1996, p. 30) like that of Eritrea. On the other hand, in the European sense there had never been a cadastre in England and in its former colonies until recently. But its land registration system has had strong influence in the former colonies. For example, the Torrens system of Australia (including New Zealand), influenced by English law and practices has a ‘title register’ of land and the impact of this system is also seen in East Africa like Kenya and Western Canada (Ibid, pp. 44-51). Poor and developing countries like Eritrea need to learn from these experiences in order to properly manage their land and its resources. Ownership of land in Eritrea is the exclusive right of the government. Every Eritrean citizen and all foreign investors have the right of access to land for farming, pasture, housing and development purposes. All land left from allocation to usufructuaries will be directly administered and its utilization decided by the government. Land degradation: diminished productivity, destruction of forests and vegetation, depletion of agricultural resources, etc. Be standard and applicable throughout the nation. Women shall have equal rights to land as men. Register all land, rights over land and duties that emanate from such rights, and the transfer of property through sale, donation, succession or other manners. Designate Eritrea as one registration district or, as may be necessary, establish registration districts to open and consolidate registries, issue directives pertaining to the administration and monitoring of the registration districts. Properly register, as necessary, all tiesha land, agricultural usufruct, leasehold, as well as land being utilized and unutilized by the government. Give information to persons enquiring transfer of buildings, whether the property has any encumbrances or not by charging appropriate service fee. Register right holders together with immovable property erected over it, to land allocated prior to the promulgation and restrictions thereof in accordance with the directive to be issued, based on this proclamation. The main purpose of the cadastre in land and property registration is to establish certainty of ownership and right through publicity and legal protection. Similarly, the main focus of the Eritrean Cadastre has been the registration of rights over land parcels and ownership of buildings. Data in the cadastre include: textual data of property description such as property identifier, zip code, property address, location, land use, land and building area, building date and type, building purpose and license, the nature and duration of use, boundaries, etc. ; proprietorship section such as owners/right holders name, address, Id number, spouse name, date of purchase, vendor’s name and address, etc; and encumbrances such as mortgage, pledge, release of mortgage/pledge, etc. The spatial system is yet to be integrated. Cities and towns are growing fast. Asmara, the capital city, for example, had a population of 98,000 of whom 53,000 were Italians in 1939 (Free Encyclopedia, 2009). According to municipal registration it had a population of 429,939 in 1998, and this has now grown to 570, 000. The number of parcels, buildings, or deeds that can be registered could be estimated from the fast growing population since obtaining actual statistical data is not easy. Parcels of land may be given for building purposes but their registration in the Office depends on the processing by other departments. Because of this tens of thousands of constructed buildings are still unregistered. This should be seen in the light of the Office and related departments’ low institutional infrastructure. The following statistical data are illustrative of the small scope of work done. Note: During 1992-1998 the Cadastre Office was in the Ministry of Justice and from 1999 in the MLWE. The above fees are decided on arbitrary basis and are being paid in the Cadastral Office upon registration. The stamp duty charged by the Notary Public is 5.00 Nfa whereas for a property being bought is charged property transfer fee of 9% of assessed value by both the Ministry of Finance and Zonal Administration. The % of the assessed value of Eritrea looks relatively higher than that of Sweden whereas that of the stamp duty and mortgage are low. The rate of stamp duty in the registration of property conveyance in Sweden is based on the assessed value: 1.5% for private individuals and 3% when a property is bought by a legal person and for mortgage registration 2% of the sum and is collected upon collection of documents (Swedessurvey, 1998, p. 10). The transfer cost of buying a house in countries like France, Portugal, Spain, Ireland, Italy, Germany, etc. is higher than that of Sweden, and particularly those of France, Portugal and Spain higher than that of Eritrea. According to the Proclamation (NO. 58/94), land as a state property can not be sold and hence may imply that land has no financial value. But, in reality it has implicit value reflected in the variable selling price of similar buildings having similar land areas and located in different zones of a town. For example, the selling price in the center of the city (Asmara, the capital city of Eritrea) is almost double that in the periphery of the city. This shows that location is the most important factor in determining value. Besides, where land is privately owned it is used for mortgage whereas in countries where land is state owned, like in Eritrea, immovable property erected over land is used for mortgage. Mortgaging is the basis for security of loans for investment. The owner applies for mortgage registration to the banks or other financial institutions for a property registered in the Cadastral Office. All mortgages are handled by banks and other credit institutions and sent to the Cadastral Office for registration. Then the property is kept under mortgage registration and is not released until full payment of the debt is made. Moreover, annual rural tax amounting 18.00 Nfa is paid for agricultural lands allocated to the peasants on usufruct rights on the basis of flat rate, irrespective of the size and fertility of land. This amount of tax which had been continuing for a long time needs revision. It is widely believed that land to serve for development it ought to be privately owned and marketable. Land in Eritrea as state owned is not marketable, but a usufruct right to land is given for life- time and the lease contract extends up to 60 years. This is relatively short compared to many countries, which reach up to 99 or 999 years (Larsson, 1996, p. 42). However, it can be renewed when the contract term expires. Urban land is one of the most valuable economic and social resources of any country that needs adequate measurement systems for proper management and control. In Eritrea, the Cadastral Office (see Figure 1) is mandated for the registration of land and other immovable whereas the Department of Land is mandated for land use plan, land allocation, cadastral surveying, land lease contract and implementation of land laws. Besides, cadastral surveying of urban and semi- urban areas is being carried out by the Department of Urban Planning and Development in the Ministry of Public Works. In addition to this, cadastral surveying of buildings in Asmara is being carried out by the Department of Infrastructure of the Municipality. In the naming of parcel id (slight difference) and naming of property boundary differences exist between that of the Municipality and Land Department. The Department of Land follows the internationally recognized bearings of North, South, East, West whereas the Municipality uses descriptor like In front, Behind, Right and Left using the front gate as reference point, and looking outward. In countries like Sweden, the National Land Survey is responsible for surveying, but municipalities with the necessary competence are also entitled to carryout property formation and registration (Swedesurvey, 1998, p. 2). But unlike that of Eritrea, in Sweden and many other European countries there is standardization and competence. In Eritrea, the relationship amongst the Departments is horizontal and all these works need appropriate control, coordination and standardization. 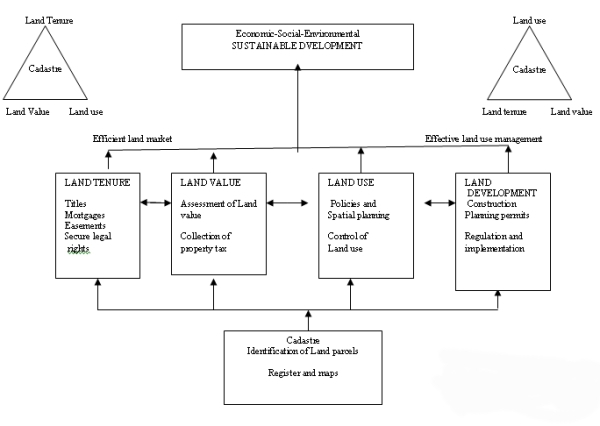 In many countries, the land administration systems and their core cadastral components (Annex 1, Figure 2) are essential infrastructure facilitating implementation of land policies. In such systems the cadastral parcels through land administration and management systems give the basic infrastructure for running the interrelated systems within the areas of land tenure, land value and land use (Enemark, 2003, p.6). Fig. 2: A Global Land Administration Perspective (Enemark, 2001). There is access to land by both men and women; the main problem is that usufruct right to agricultural land, which is main tenet and content of the proclamation, is yet to be implemented according to the Land Law. Besides, allocation of land lease to housing purposes and upgrading squatter areas have not proceeded with the desired strides. The costs could be high, but providing sites for housing purposes and upgrading squatter areas to properly planned houses looks unavoidable. This delay might have been caused by the ‘Border War’ with Ethiopia and the ‘no war, no peace’ situation prevailing after the Ethiopian government refused to abide by the ‘final and binding’ verdict of the Border Commission. Moreover, there is inadequate institutional infrastructure to carry out effective cadastral mapping/surveying work. According to the Registration Law, registration is compulsory but because of the above conditions it has not gone far beyond the voluntary one. Records are also manually kept that makes integration of data difficult. It is only with the help of computer technology and through the registration and formation of computerized land information systems (LISs) that reliable information for improved land management could be attained. This offers good opportunities for automation of the cadastre and the creation of LISs; provides better access to information, facilitates data exchange and coordination. With the assistance of UNDP Country office few computers, server, scanner, photocopier and printer were made available, but are inadequate. Computer systems, however, require infrastructure, good maintenance and communications and well- trained operators (Osterberg, 1994, p. 9). Currently the office has established a computerized cadastral system, but without its integral, spatial part. The Office has inadequate capacities to integrate the spatial data with textual data. There are still inadequate human resource capacities to manage and run the system effectively and efficiently. But, the development and management of such a system requires technical know-how in programming and data base management. Produce statistical data for management; etc. To establish a modern computerized cadastral system. Charge appropriate fees for services rendered and introduce other mechanisms to generate funds for sustainability. Land allocated on lease for dwelling, commercial agriculture, and other social purposes. In the light of the above priorities, objectives and strategies, the Office is working in coordination with the Departments of cadastral surveying/mapping and other partners. The cadastral surveying for registration is being worked by different departments. These departments use different cadastral surveying instruments such as GPS, total Station, etc. The Land Department, for example uses GIS for its spatially referenced system. But such works seriously require harmonious coordination and standardization of work procedures. In the Administration of cadastral data, national standards of data for use and exchange, security and privacy, data protection, and legal liability, etc. are essential. Then what are the main constraints that hinder the implementation of its plans and activities? Absence of Notary Public or ‘ real estate agents’ in the remaining five Zobas (regions) for authenticity of agreement and facilitating fast transactions of property. A cadastre system should cover the whole country or a definite geographical area and proceed step by step in order to provide the necessary information and benefits. Our cadastral system unlike many others lacks this. Besides, the need of parcel-based LIS for coordination of information, standardization of data and procedures and integration of new data is great. This work needs tireless efforts to materialize. Moreover, there are other institutional constraints that need considerations: appropriate office establishment, and the re-organization of the notaries public in all zonal regions for authenticity of contract and fast transfers of property. The German adaptation of a system of titles (19th century), and the Swedish and Finish experiences of developing cadastres and land registers from simple and less costly ways, developing progressively into smoothly operating systems have flexible and progressive approaches (Larsson, 1996, p. 39). Given the meager resources of poor countries like Eritrea, the developed European system in general, and the Swedish system in particular, a progressive system that evolved gradually and has gone the furthest in the cadastral automation relative to other countries seems to throw an insight for learning creatively. In Eritrea, the conceptual understanding of the cadastral system needs to further develop in the medium and long –term strategies. It needs to go forward to implement comprehensive cadastral system learning from other countries’ experiences and best practices. A more realistic and pragmatic approach to our cadastral system is needed. Currently, it is neither a core component of the land administration system nor has a strong link between land administration and objectives of sustainable development. It should sooner than later develop step by step following the ‘progressive cadastre’ approach into a cadastre having comprehensive coverage to ‘automated’ cadastre (Larsson, 1996, p.39). This could possibly be achieved faster through cooperation with partners that could enhance the needed institutional infrastructural building efforts. Cadastral/land registry systems of Europe, for example are strongly influenced by the concept of land information that have multiple uses, automation, geocodes and digitization, and conversion of land related information into spatial systems (Larsson, 1996, pp. 35-6). As land information is a basis for planning development and control of land resources, the only option left is to follow that way. However, it is not an easy way: institutional capacity needs to be improved to meet the medium and long term needs of the Office. Capacity building should be seen ‘comprehensively in the wider context of developing institutional infrastructures’ addressing the ‘societal, organizational, and individual levels’ (Enemark, 2003, p. 4) for sustainable implementation of land and cadastral policies. Cadastral surveying work is a key in the development of cadastral/land registry systems. Such work requires either a central agency responsible for control, coordinating and standardizing these works or is integrated with the cadastral/land registry systems. Standardization is a key to developing national cadastral system, computer networking and data exchange arrangements. Our cadastral system charges fee for registration and other related services provided, but are inadequate to develop and run the system. It is heavily dependent on government funds; but this should not continue indefinitely. With the development of the system, it needs to upgrade the existing system of service fees and introduce other marketing mechanisms to ensure its sustainability. There is a saying ‘a journey of one thousand kilometers begins with one step’. The Eritrean cadastral system, though has a tradition of more than a century, it is still in its infant stage. It is incomprehensive and its computerized cadastral system not yet integrated; its most important integral part, the spatial part. Sooner than later this has to be done. It is not a choice to be made but a must that has to be done by a country to properly manage land and its resources and fit within the global economy competitively. The ‘progressive cadastre’ that goes step by step to a national coverage and automation is a good approach that has to be followed. However, institutional infrastructural buildings efforts demand seriousness of purpose and resource. Besides, gaps in human capacity are required to be upgraded with appropriate education and training for efficient and effective functioning. The success of cadastral systems depends heavily on competence and technical know- how of staff. Hence, these works demand serious commitment by the Office as well as higher authorities. It is only through these efforts that a modern computerized cadastral system could be established and developed. Other countries’ experiences also show that the success of cadastral systems depends neither on its laws nor on its technical complexity. It heavily depends on whether it protects land and property rights, facilitates fast and efficient transfer of rights and ownership and is up-to-date. Guaranteeing this is imperative.